But all this is old news and obscures why the media industries should actually be afraid of Kim Dotcom, very afraid. Dotcom has the vision for a differentiated consumer experience that no other ‘piracy’ innovator has yet had. Prior to his much publicized FBI raid and the closure of Megaupload.com, Dotcom was on the verge of launching a new, interactive, multimedia content service called Megabox. It didn’t happen, but – judicial wrangles permitting – it will, and will likely be built upon the foundations of the newly launched Mega. To date file sharing (by which I mean all forms of unlicensed content downloading and uploading, not just P2P) has been in a secrecy arms race with the media industries. Every time the media industries have caught up with file sharing, the networks and services have devised new means of evading policing and enforcement. Although media companies have always inherently been trapped in reactive mode, unable to set the terms of engagement, this strategy has nonetheless been highly effective at keeping file sharing services on the back foot. As with the cold war two super powers have expended vast resources staying still, investing heavily in being armed to the teeth. The net result is that piracy has continued to grow but hasn’t been through any transformational innovation in years. Also the sites and services have become progressively more complex and sophisticated to use and navigate. Pushing them slightly further away from the mainstream. The nightmare scenario for media companies is that the pirates turn their attentions to developing great user experiences rather than just secure means of acquiring content. What if, for example, a series of open source APIs were built on top of some of the more popular file sharing protocols so that developers can create highly interactive, massively social, rich media apps which transform the purely utilitarian practice of file sharing into something fun and engaging? If you though the paid content market was struggling now imagine how it would fare in the face of that sort of competition. Kim Dotcom has the requisite combination of vision and balls to take piracy through a user experience revolution. If he does then piracy will become a vastly more worrying adversary for media companies than it currently is. Today the UK’s High Court ruled that UK ISPs must block access to the Pirate Bay on their networks. The idea isn’t a new one, Wippit’s CEO Paul Myers first touted the idea of UK ISPs voluntarily blocking access to P2P sites nearly a decade ago. In some ways it is intriguing that it has taken so long for media industries to come round to the idea of enforcement via domain blocking rather than going straight after file sharers themselves. The Sopa / Pipa legislation had many faults but it was markedly more forward looking with its focus on blocking domains than the old school French Hadopi bill which opts instead for the ‘punish your own customers’ approach. Of course domain blocking itself is beset with challenges and moral dilemmas, but of the tools available to media companies domain blocking can make a pretty compelling case for being the best blend of effectiveness and consume friendliness. After all, the aim of any piracy enforcement is not just to stop the activity but also to persuade illegal downloaders to become paying customers. It is much easier to try to convert a file sharer who is getting frustrated not being able to find free unlicensed downloads than it is one who you have just taken to court and sued for damages. VPNs: Virtual Private Network (VPN) applications can enable a user to tunnel out of their ISPs’ network, bypassing domain filtering systems such as BT’s Cleanfeed system which will be used to implement the Pirate Bay ban. Although VPNs have well established legitimate business uses, a number of VPN providers, such as BT Guard, are positioning themselves explicitly as tools to evade piracy enforcement. VPN providers may become the next front in the war on piracy, with media companies likely to start subpoenaing their user activity logs. Some providers have already started putting anonymity systems in place, such as not tracking IP addresses and deleting logs after 7 days. Proxy servers – which can be used to circumvent domain filters – are another option, often used in conjunction with VPNs. New domains: the most challenging aspect of domain filtering is keeping track of all the new domains. Earlier this month in Belgium the Antwerp Court of Appeal imposed a Pirate Bay domain block on two Belgian ISPs, a band which covered 11 associated domains. Within days the Pirate Bay had registered a new domain depiraatbaai.be though that was swiftly added to the ruling and Belgian users now get this message if they try to access any of the Pirate Bay domains. The Belgian example illustrates how easy it is for new domains to come into play. Effective domain filtering is an iterative and continual process that can only work well with willing cooperation from ISPs. Going to the High Court to secure a new ruling every time there is a new domain is simply not viable. The aim of domain blocking, as with all piracy enforcement measures, is not to turn off the tap entirely but instead to make it so inconvenient for mass market consumers that the activity will become unappealing. So the technical challenges need not be fatal flaws in domain filtering strategy if the net result irritating inconvenience for most users. The Pirate Bay has had the unusual effect of creating a centralization of activity for decentralized file sharing. As networks went decentralized to evade enforcement, the Pirate Bay pulled the Torrent diaspora together to create a nice big juicy target for media companies. Removing the Pirate Bay from the UK web will have a significant impact on file sharing, at least in the short term. There are only a handful of other public sites that index torrent files and have a working tracker, though there is a longer list of sites that have indices but not trackers. If the music industry acts quickly and puts something new and compelling in place to capture the demand of frustrated Pirate Bay users then there is a strong chance that a host of new digital music customers can be won. But that means a new generation of product. The 99 cent download and 9.99 subscription have proven patently uninteresting to the majority of digital music consumers (by which I mean people who listen to music digitally and / or access it digitally). The alternative is the risk of some of those users simply falling out of the music consumption arena (as appears to have happened in the US) with the rest soon being catered for by a host of new unlicensed alternatives filling the demand vacuum. A carrot and stick approach is always going to be an evolving strategy. But when the stick changes, so must the carrot. Adam also shares his vision for the music industry annd his concept of ‘creating an API around the entirity of music’. Take a look and let me know your thoughts and comments. As I posted earlier in the month, the music subscriptions space is going through an important period of transition. It took much of the last decade to realize that the 9.99 premium rentals model was only ever going to appeal to a niche of music aficionados, and though global premium music subscribers total 8.25 million, we’re still no closer to mass market appeal for premium subscriptions. And yet we have a host of new entrants including, MOG, Spotify Premium, We7 Premium, Sky Songs, Virgin Media etc etc. So what’s changed? Well, both a little and a lot. The niche audience is getting bigger. Firstly, the appeal for premium subscriptions is still a niche addressable audience of tech savvy music aficionados, but that audience is growing. It’s still far from mass market (and never will be) but it’s a more attractively scaled base now. A few million per major music market perhaps. For a company like MOG that’s plenty enough addressable market. Also improvements in consumer technology and connectivity make it easier to deliver a high quality on-the-go cloud based experience, a crucial asset. that a recurring household music purchasing relationship is much more valuable and secure than ad hoc individual spending and illegal downloading. MOG has an additional crucial asset: the service is inherently social. Regular readers will recall that I posted about the concept of ‘putting the crowd in the cloud’, that social interconnectivity in cloud based services will become a crucial component of music discovery and engagement. MOG joins those dots. range telco partnership opportunities that the UK presents due to the government’s strong(ish) stance on making telcos partners in tackling music piracy. A subsidized MOG service from BT, integrated into their IPTV boxes and xBoxes, for example, would be a really enticing prospect. I’ll be writing up a follow up piece to my original post soon, addressing some of the recurring themes in the comments. In the meantime, here are the comments. I’ve tried to keep a balanced representation of opinion and they are largely chronological. There are some real gems in there too. As an artist, it’s my choice whether to give my music away or try to force the common public to pay for it. Do I deserve to be forced to? No. If everything is for free then how do artists make money. Why should art be free but not anything else? Music doesn’t have to be free to be fair to the consumer, it just needs to be sensible. A strange thing happened to me this morning. I had to get a new car battery and you know what? The guy from AAA wanted me to pay him for it!!! I said to him, “How are you gonna build any brand equity this way?!?! I finally caved in and paid the guy. Unbelievable! Record labels and artists are just as guilty as consumers for not being innovative and either going along with it blindly because the got a deal or because the same old prehistoric fat cats that have been exploiting artists for decades are still there and refuse to give up the excess they are used to. Not everyone fits the profile of an indie band. If every person on the planet wants to work for free, maybe the people in the music biz will join in. In the meantime, everyone needs to buy food, provide shelter, and take care of their families. Composers and songwriters do not have “add-on services.” They do not have advertising revenue….not everyone fits the newcomer “indie band” model that can sell T-shirts and CDs at their next concert. $0.99 for a song is a ridiculously good deal for something you want, can keep forever and play on all your personal devices. Good tunes aside, everyone who wants my stuff for free should also want to pay – UPFRONT – for the cables, gear, time, talent, etc that went into the music they like. Q. EVERYBODY GETS PAID FOR WHAT THEY KNOW AND HOW THEY EXECUTE. WHY SHOULD MUSICIANS BE TREATED ANY DIFFERENTLY? A. Because if people CAN pull it, they will. People are happy to pay McDonald’s, tobacco companies, and anyone else their hard-earned money to kill them slowly and break their bank, but to pay for something you enjoy, that does all of the things that art does for us, if you can steal it, why bother? Frankly, anyone should be happy to assign a reasonable value to the work of those responsible for creating the soundtrack of our lives. I know I do. The Music Business is indeed an incredibly tough one to survive. Thank goodness for those willing to stay the course. As far as giving away 200 digital copies online to sell 20 – that makes perfect sense to me – much more so than giving a plugger or publicist $2k! We are all learning. That’s why we’re blogging about this topic. But so far, I’ve only gleaned that you gotta be well established in order to devalue your main craft and make a living at it. That’s cool if you pay my bills. When I can afford to be a philanthropist, I will. I’m not in favor of free music, but when it comes to 30-second snippets and other promotional tools (even a CD if a band WANTS to give it away), I believe they ought to be very, very free. Regular readers of this blog will know that I take a pretty hard line on the idea that music can ‘just be free’ and that I take a fair share of flak for my position (see my previous post here for background). Numerous sites, forums and discussion boards pride themselves on their ‘everything should be free stance’ and argue that only money grabbing cynical artists would ever take the side of record labels in the piracy debate. This is patently not the case. Last week’s statement on tackling piracy from a 100 UK artists illustrates that artists care about this. They understand that if people stop buying their music and download it for free that they simply won’t be able to be professional musicians anymore. I for one used to be a struggling recording artist, many years ago. I never made enough money from music sales to give up the day job, but I would have loved to be able to. Not so that I could be rich, but so that I could spend more time doing the thing I loved: making music. It is easy to argue that if consumers want music for free that the industry will simply have to adapt and develop free business models. But we don’t like our favourite artists because they or their record labels are good business people. If the music industry proves inflexible enough to adapt to a free model and many professional artists go back to their day jobs who has won? If the music business (in whatever guise it may evolve – i.e. it doesn’t have to be record labels at the centre of it) locks into a race to the bottom, ultimately less money will filter back to the artists. That means that fewer artists will get contracts, and artists will have shorter careers. Many more aspiring artists than today will never make it out of their MySpace page or their day jobs. One of the counter arguments used by commentators is that having a MySpace page is an ends in itself these days. No, it is a means to an end, and the VAST majority of artists see it that way. If an aspiring artist doesn’t get signed to a label / publisher / agent they’ll remain one of those many tens of thousands of artists struggling to stand out from the crowded pack on MySpace. The majority of artists just want to play their music to their fans and to be able to make a living out of doing so. Most artists with record deals won’t and don’t make much money out of it, but they get to do what they love, and we get to enjoy their music. But that model breaks down if people stop paying for music, whether that be buying CDs, downloads, gig tickets, ring tones etc. And yes, of course, ‘feels like free’ models can pick up the slack, but they won’t do the job on their own, and they certainly won’t do enough whilst illegal free services continue to dominate. Yesterday 100 UK based musicians got together in a behind-closed-doors meeting to thrash out their differences and agree on a position on file sharing. This was done in the context of a deadline next week for submissions to the UK government on suggested provisions for tackling file sharing. It also comes in the week that Lilly Allen closed down her ‘anti-file sharing’ blog after just three days because of the vitriol that came her way as a direct result of starting it. After a reportedly heated debate the artists agreed on a statement to “alert music lovers to the threat that illegal downloading presents to our industry” and voted to support a plan to send two warning letters to file-sharers before restricting their broadband speeds that would “render sharing of media files impractical while leaving basic e-mail and web access functional”. There is obviously a distance between this position and the record label position of termination of access on the third strike, but it still represents a massive change in artist opinion. Compare and contrast with Travis’ Fran Healy stating that file sharing was ‘brilliant’ back in 2003, hot on the heels of Robbie Williams having said it was ‘great’ earlier in the same year. (It’s worth noting that the Featured Artist Coalition of which Williams is a member was a part of this week’s meeting). So what’s changed? The decline in music sales can now be seen as a fundamental market realignment rather than the blip it looked like at the turn of the century and artists are beginning to get worried. Many might not have seen much money from their labels once costs had been recouped but they recognize the marketing and talent development value that labels bring and that without them they wouldn’t be able to sell as many gig tickets or t-shirts. It worth keeping a sense of perspective on this though. Are we to believe that these 100 artists suddenly coalesced around this issue just as their paymaster record labels are nearing a pivotal stage of their lobbying efforts? Probably not. Also Radiohead’s Ed O’Brien said that the meeting got “quite emotional” and “a little heated at times” which suggests that there was strong diversity of opinion and that this statement is not a definitive representation of all artist opinion. However, the fact remains that these 100 artists did attend and did bury their differences to deliver a powerful compromise statement at first time of asking. This illustrates their collective recognition of the urgency and seriousness of the situation. So even though artists and record labels will always have differences of opinions and agendas, they’re beginning to recognize that they have a lot of common ground. 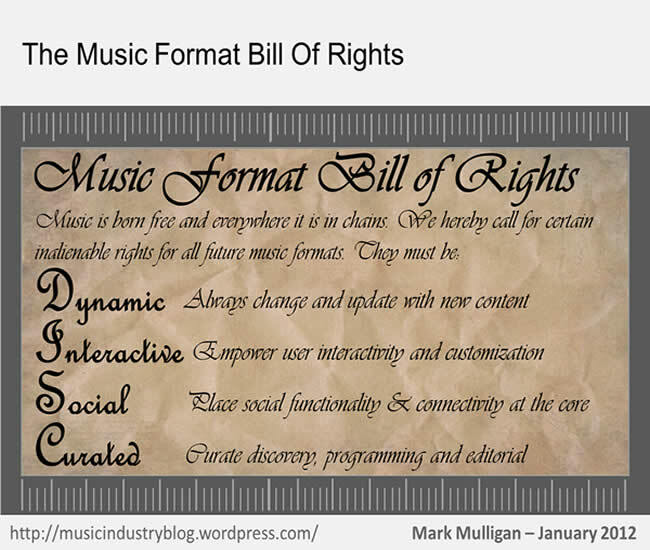 Together they can start to educate the marketplace that music cannot just be free. Somebody somewhere has to pay else the investment in artists ultimately dries up. It’s easy for a file sharer to say that music should be free and that labels and artists and labels are greedy, just in the same way it’s easy for a burglar to say that the owners of a nice house are greedy once he’s stolen from it. A wholesale revision of music business models and practices is both necessary and is beginning to happen, but that is not an excuse to allow file sharing to go unchecked until that process has run its course. Of course compelling and differentiated legal services are the best way to fight piracy, but there also needs to be a clear legal framework and, even more importantly, a shift in consumer mindset. Most file sharers wouldn’t dream of stealing a CD from a music shop, but don’t hesitate to download tracks via BitTorrent. If this shift towards artists being seen to take a stance against file sharing helps to start the requisite change in mindset then that will be a true achievement, more so than if they influence the legislative process.